Emus are the second largest birds in the world and the largest birds native to Australia. Ostrich is the largest bird in the world by height and a native of Africa. The emu have deep brown feathers and generally is very difficult to distinguish between the male and female of the species. However, during the mating season the emu hens grow black feathers on the head and the bare skin on the head turns blue. The male and female ostriches on the other hand have different colored feathers. The male ostriches have black feathers with white on the wings and tails while the females have grey brown feathers. The Emu has very strong legs with three toes which allow it to run at speed of upto 30 mph. The feet are said to be strong enough to kill a human. The Ostrich has extremely strong legs with two toes that are designed in a manner to enable it to run at speeds of upto 40 mph. The ostrich also have exceptionally large eyes in relation to their heads. In fact they are said to have the largest eyes among the land vertebrates. The Emu is extensively farmed now for its meat, oil and leather. This oil is made from emu fat. The ostrich is also farmed extensively but mainly for its feathers. The soft feathers are in great demand for making dusters as well as decorative items. The ostrich meat and leather is also marketed. The emus form pairs during the mating season and will stay together for around five months. After the female has laid her eggs they become the responsibility of the males and the males incubate them while turning them upto 10 times a day. During this period of incubation the males do not move out of the nest and does not eat or drink for the entire incubation period of 56 days. The chicks stay with the fathers for the first five to six months and around the same area for the first two years. The ostrich male would generally take over six to seven females during the breeding period. All the females in the group lay their eggs in the same nest. The dominant female lays her eggs first. The eggs are incubated by the males and the females in turns with the females during the day and males during the night. This provides a natural camouflage to the nest with the females blending in the ground and the males black color blending in the night. The males defend the hatchlings and teach them to feed, however, very few survive the predators. 1.Emus are the second largest birds native to Australia while Ostrich is largest bird native to Africa. 2.Emus have deep brown feathers with it being very difficult to distinguish the males and females except during mating season while the ostrich males have black and white and females have brown feathers. 3.Emus have three toes with speeds of upto 30 MPH while ostrich has two toes and speeds of upto 40 MPH. 4.Emus are farmed for their oil, meat and leather while ostriches are farmed for their feathers meat and leather. 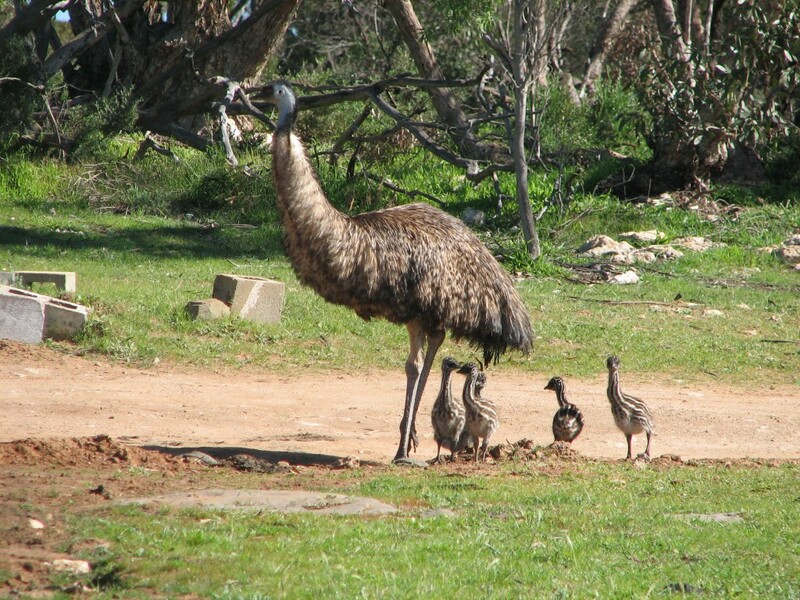 5.Emus pairs for mating but the incubation and raising the chicks is done by the males alone. The ostriches form groups with each male have six to seven females and the incubation is done by them in turns. N Amit. "Difference Between Emu And Ostrich." DifferenceBetween.net. October 12, 2017 < http://www.differencebetween.net/science/nature/difference-between-emu-and-ostrich/ >. Very helpful information thank you! Looked up difference between emu and ostrich. Got to the very first word under the heading and immediately lost my faith in your credibility. The plural of Emu is Emus. Big bird from Sesame Street) wants to kick some sense into you! emus may be plural; however, “emu’s” is possesive. Emu and ostrich chicks are precocial, meaning they hatch with down feathers and open eyes, and leave the nest in a matter of days. The toes of the ostrich developed though natural selection, they were not designed by anyone.